Your Yorkie puppy is the product of careful breeding and should remain healthy for at least a dozen years, if not more. Just like you, your Yorkie needs a healthy diet, plenty of exercise and regular checkups. Maintain your vet's recommended schedule for vaccinations and checkups to ensure that your puppy will be with you for its full life expectancy of 15 plus years. A Yorkie puppy is a baby, and for the first year, you will want to ensure that your baby gets plenty of rest. It's normal to want to take a Yorkie puppy everywhere with you and to let everyone hold it and play with it. But a Yorkie puppy will not thrive unless it gets regularly scheduled sleep periods. Feed your puppy an enriched puppy kibble for the first year of its life to maximize healthy growth and performance. Say no to table scraps. Hudson looks a little worried about his weight gain. A slim, trim dog is a happy dog. Plenty of exercise and a balanced diet will go a long way toward keeping your dog healthy. Adequate exercise also promotes mental well-being and prevents the development of many behavioral problems. During the hot summer months, only walk or romp with your Yorkie in the cooler morning and evening hours. Be alert for hidden dangers lurking everywhere in your home. Learn to look at familiar objects and furnishings through the eyes of your puppy. Dangling cords, sharp tools, small objects left on the floor or in reach of a puppy can all lead to trouble. Pick up and put away anything that could be dangerous to a curious or teething puppy. Restrict access to toys that can be chewed up easily or that are small enough to get stuck in the airway if swallowed. To prevent choking, make sure food is cut either in large pieces that cannot be swallowed whole, or in very small pieces. Dusty and Twigs' mommy, Coco. Notice any unusual behavior or odd physical symptoms? Schedule a veterinarian exam before the condition worsens. Then call your Yorkie's breeder to report what is happening. Remember: unless you're a veterinarian (or your dog is choking) don't try to treat your dog yourself. For some reason pets are ingesting more poisons than in the past. Perhaps there are more products around these days that are made with poisonous ingredients, or perhaps with our busy lives we forget to put things away in a safe place. Whatever the reason, there is a significant increase in the number of pets dying each year from poisonous substances. If your Yorkie does eat something that you think might be toxic, immediately call theAnimal Poison Control Center Hotline (888) 426-4435 and then contact your veterinarian or emergency vet hospital. Consider using products containing propylene glycol, which is a less toxic form of antifreeze instead of those containing ethylene glycol. The list of common household substances that could be harmful if ingested by your Yorkie is too long for this page. Please visit the ASPCA Animal Poison Control Center for a complete list. The list of common garden plants that could be harmful if ingested by your Yorkie is too long for this page. Please visit the ASPCA Animal Poison Control Center for a complete list. 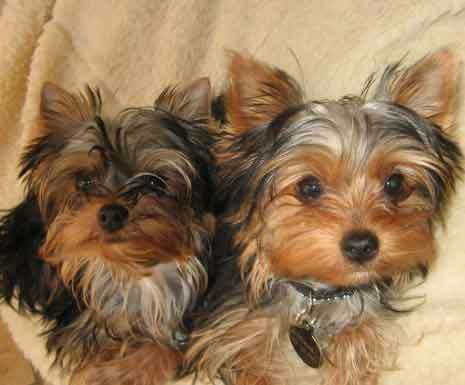 Until your Yorkie puppy is fully vaccinated, be sure it is isolated from other dogs. Then you will want to sign up for puppy socialization classes, or make play dates with older, well-trained dogs. 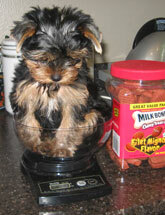 Be sure other dogs are no more than 3 times your puppy's weight. Pet stores are also a great place for dog interaction. However, keep your puppy away from animals that are being sold at the pet store. Rescue dogs may have behavioral and/or health issues that could endanger a Yorkie puppy. Between 12 and 16 weeks of age is the "sweet spot" for socializing your Yorkie puppy. As soon as your new puppy is settled in your home, you should begin socialization and obedience training. Socializing your Yorkie is an important step in their healthy development. Dogs that are not properly socialized can become shy or fearful of people or other dogs. It is important to introduce puppies to new sights, sounds and places every day. Some experts use the “Rule of Seven” to begin socializing puppies. That is, between 12 and 16 weeks of age, you introduce your puppy to seven new kinds of people, seven new types of surfaces, seven new foods, seven new sounds, and seven new places. The dangers of extreme heat for humans also apply to Yorkies. Heat stroke is an essential problem to look out for. Signs of heat stroke include excessive panting, staggering, seizures, bloody diarrhea or vomiting, coma, body temperatures above 104F, and dark or bright red tongue and gums. Take your Yorkie to the veterinarian immediately if you suspect heat stroke. Use cool water, not ice cold, to cool down. Offer ice cubes to lick until you can reach the veterinarian. If airway obstruction is due to a foreign object, it must be cleared immediately. Do not wait for veterinarian assistance. Clear airway and perform Yorkie Heimlich immediately (see right column). When your Yorkie stops choking he will probably bite you, but I assure you, you will not mind! Dusty and Twigs resting up after a romp 1/20/08. Click here to open and print an illustrated copy of these lifesaving instructions to keep with you in case of an emergency. Since these maneuvers don't come naturally and may be difficult to visualize just from reading the instructions, it would be wise to practice them several times on your healthy Yorkie, so you will be prepared if you ever actually need to use them. Place animal on either side. Gently tilt head slightly back to extend the neck. Gently pull tongue forward between the front teeth. Use finger to check for and remove any foreign material. Do not pull on thread if some has been swallowed (thread can slice through internal organs like a knife). *Please Note: The traditional Heimlich maneuver is different for dogs, and there is also a difference in the way it is done for large vs. small dogs. Hold your Yorkie upside down, tail toward your face, squeezing lower abdomen with both hands for 30 seconds while gently swaying upper body. If that doesn't work place Yorkie on its side on a hard surface with a pillow or rolled towel to raise the back legs. Support back with one hand. With other hand grasp base of rib cage and thrust in and up 5 times. Do this firmly, but not hard enough to cause internal injuries. In an extreme emergency there will be no time to go for a pillow. Just kneel behind the choking dog to grasp the bottom of his rib cage and apply firm, quick pressure 2-5 times. Open the airway (see above). Seal mouth and lips by placing hands around lips, gently holding muzzle closed. Place your mouth over animal's nose and forcefully exhale. Give 5 breaths rapidly, then check to see if Yorkie is breathing without assistance. Unless Yorkie begins to breathe regularly, give 20 breaths per minute until you reach a vet, or for a maximum of 20 minutes.